Holy Taters ‘n Beans, Batman! As it turns out, I am making a crock pot meal today… but not one which utilizes the free haunch-meat of rodents (April Fools!). A big spicy pot of something meatless was on the menu — in fact, I don’t see any meat happening in the very near future. Not until the image of the half-squirrel LouLou once did bring inside stops suddenly also being in a delicious sauce. Cut your onions, pepper and sweet potatoes. Put onion and pepper into the olive oil already heated to H on the slow cooker scale. Add turmeric and let simmer for a few minutes, then add the beans and remainder of the seasonings. Rinse out the can with a little water and mix it in along with your sweet potatoes. 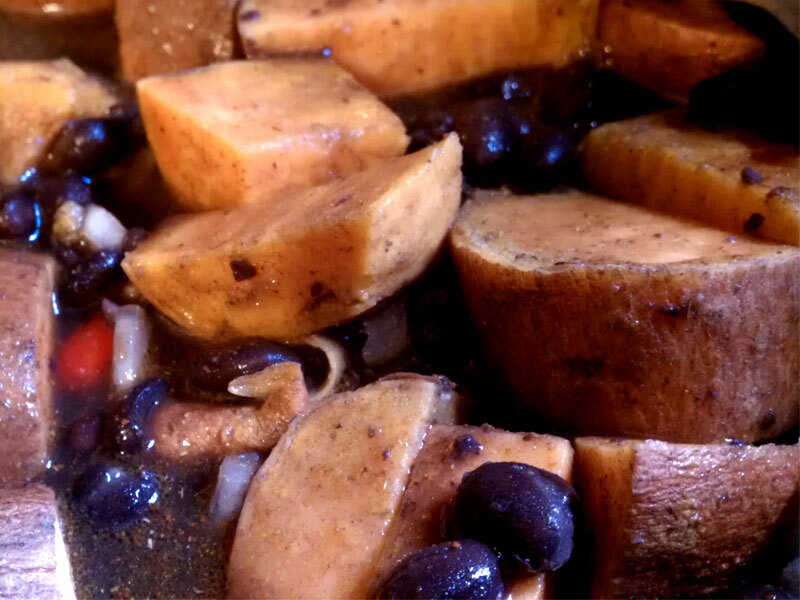 Cover and cook until sweet potatoes are tender… this can be arranged whether you’d like it set before you leave the house bright and early, or whether you want it a little quicker. Either way you’ll get at least 4 spoons for dinner.